Urban Meyer after the 41-35 loss to Michigan in the Capital One Bowl in January 2008. After leaving his coaching post for one day last December, Urban Meyer has called it quits at Florida...for realz this time. 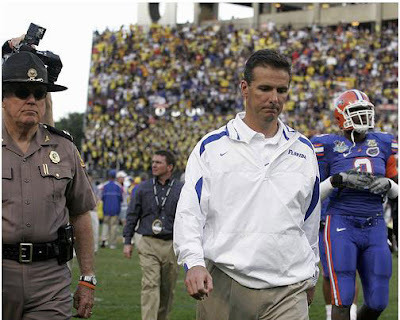 Urban Meyer is stepping down as football coach at Florida, the school's athletic director announced Wednesday. "I fully grasp the sacrifices my 24/7 profession has demanded of me, and I know it is time to put my focus on my family and life away from the field," Meyer said. A news conference was scheduled for 6 p.m. ET on Wednesday. Meyer will coach his last game for Florida in the Outback Bowl against Penn State on January 1st in Tampa. The Gators, who won two national championships and two Southeastern Conference titles under Meyer, had a disappointing season in 2010, going 7-5 (4-4 SEC). A three-time national coach of the year, Meyer posted a 64-15 record in six seasons at Florida. He also coached at Utah and Bowling Green.